Bajaj has launched its all-new Pulsar 150TD, featuring twin disc brakes and sharper design at an introductory price of Rs255,900. The new motorbike is available in three dual tone colors- black blue, black red and chrome black. Pulsar 150TD comes with split seats, split grab rails, longer wheelbase and a wider and fat 37mm front fork and wide 120mm rear tyre. This variant has undergone significant improvements in noise, vibration and harshness due to optimisation of engine and chassis touchpoints. Targeted for modern youth looking for a sportier options without compromising on comfort and mileage, the Pulsar 150 TD has a top speed of 110 kmph and weighs 144 kg with fuel tank capacity of 15 liters. 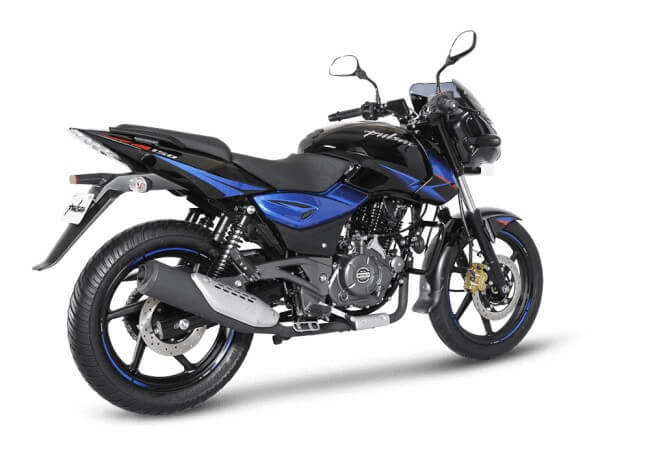 Following the trend of modern bikes, the Pulsar 150 TD is equipped with 5 gear system. Other new features included are wet multi plate clutch, air cooling system and 5-Map CDI ignition system. What remains same is the thoroughness of the 4 stroke DTS-i engine, displacing the same 149.5cc, and putting out 14PS at 8,000rpm and peak torque of 13.4NM at 6,000rpm. High ground clearance of 165 mm ensures smooth and comfortable ride on all terrains.